On September 28, Consul General Hong Lei hosted the reception to celebrate the 68th anniversary of the founding of the People’s Republic of China at Hyatt Regency Chicago. Over 600 guests including Illinois Governor Bruce Rauner, Deputy Mayor of the City of Chicago Robert S. Rivkin, friends from the fields of government, commerce, education, culture, and technology in the consular district, Consul Generals or representatives from foreign missions in Chicago, members of the Chinese community, Chinese students and representatives of Chinese companies attended the reception. Consul General Hong Lei made a speech at the beginning of the reception, saying that since 68 years ago especially the beginning of the reform and opening-up, the Communist Party of China (CPC) has led the country to transform from a weak and poor one to the world’s second largest economy, the Chinese nation from being mistreated to pursuing great rejuvenation, and Chinese people’s lives from poverty and scarcity to moderate prosperity. Consul General Hong Lei said that the last five years since the CPC convened its 18th National Congress carry special significance in China’s development course, evidenced by the new remarkable achievement in China’s social and economic development, which lays a solid foundation for realizing the two centennial goals and the great rejuvenation of the Chinese nation. In the past five years, the Chinese economy has been running within a reasonable range, the GDP has grown at an annual rate of 7.2% from 2013 to 2016, and China’s average contribution to the world economy has exceeded 30%.In the past five years, China has unswervingly forged ahead with major country diplomacy with Chinese characteristics and contributed the Chinese wisdom and solution to the world. 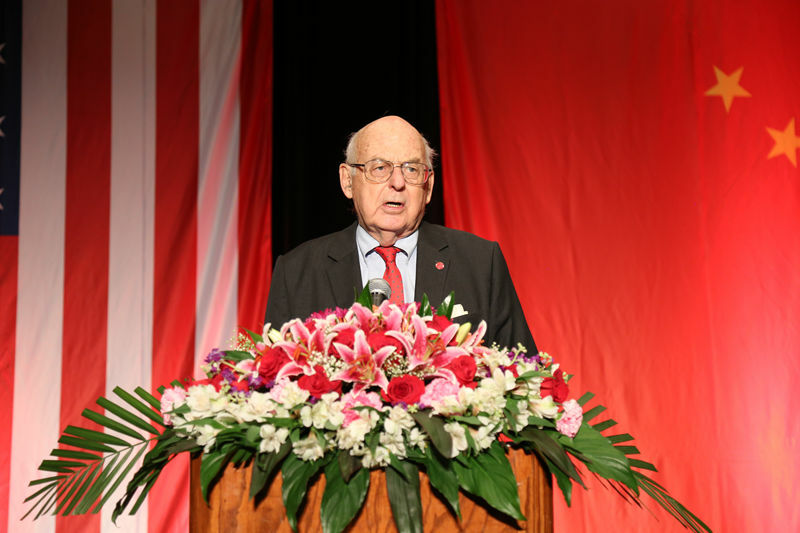 Consul General Hong Lei said that the 19th CPC National Congress will be held in Beijing next month. This meeting will lead China to completely build a moderately prosperous society, open up new prospects for establishing socialism with Chinese characteristics, and bring China towards a bright future of realizing the great Chinese Dream of national rejuvenation. A China standing at a new historical starting point will surely facilitate world economic development, enhance world security, promote global governance and present more opportunities to the world. Consul General Hong Lei said that China-US relations have been running on a stable track and realized a smooth transition in the past year. President Trump will pay a state visit to China in November. As the largest developing country and the largest developed country in the world, China and the US are having increasingly intertwined interests, and their common interests far outweigh differences. As President Xi Jinxing once said, we have one thousand reasons to make China-US relationship a success and not one single reason to break it. We are willing to work in unison with the US side to achieve more consensus and results in bilateral cooperation and open up new prospects for China-US relations that are in the best interests of the two peoples and beyond. 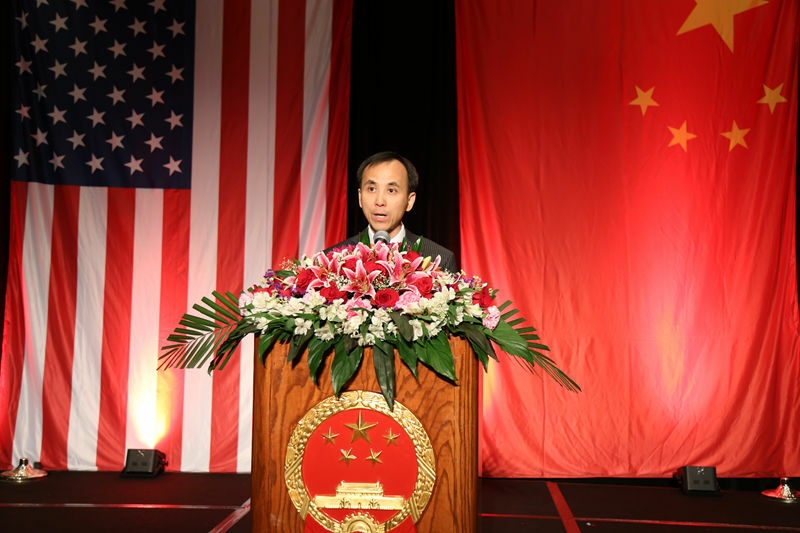 Consul General Hong Lei said that the past one year has witnessed booming exchanges between China and the nine Midwest states my Consulate covers. Former Iowa Governor Terry Branstad was sworn in as the US Ambassador to China in July. Since this summer, Governor Bruce Rauner of Illinois, Governor Kim Reynolds of Iowa,Governor Eric Greitens of Missouri and Governor Rick Snyder of Michigan have paid visits to China, greatly boosting the cooperation and exchanges between the Midwest and China. The annual trade volume between the nine Midwest states and China has exceeded $90 billion, and over 200 Chinese companies have invested in these states creating 46,000 jobs. The 2017 gala of the China General Chamber of Commerce Chicago Chapter was held successfully. Over 20 companies from China and the US signed a contract in Des Moines on China’s import of soy bean, pork and beef from the US worth of $5.012 billion. CRRC Sifang America has started construction on a rail car manufacturing facility in Chicago. Consul General Hong Lei said that cultural and people-to-people exchanges between China and the nine Midwest states are also on the rise.At this year’s Spring Festival, seven artistic troupes from China presented 17 performances in the nine states attracting over 20,000 audience. The City of Chicago has organized the Happy Chinese New Year celebrations for four years consecutively. 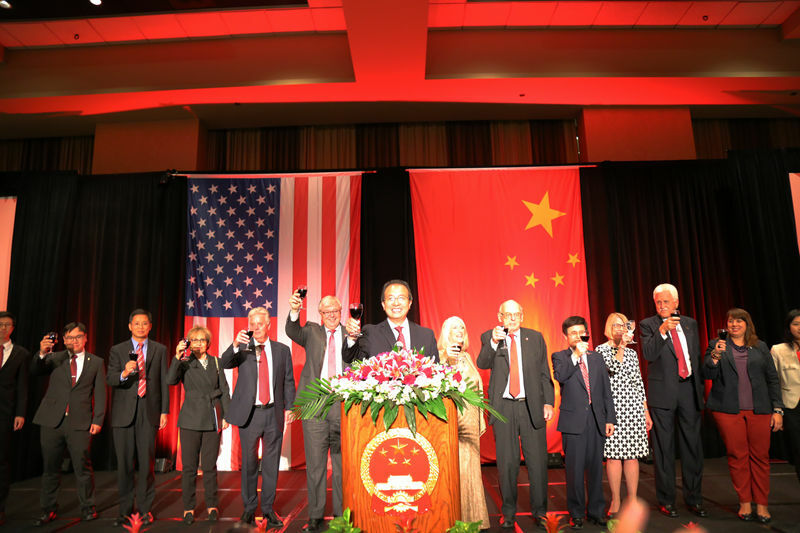 Zhejiang Province and the State of Indiana, and Shaanxi Province and the State of Minnesota have just celebrated the 30th and 35th anniversaries of their sister state-province relationship. The Chinese Pingpong world champion delegation came to Chicago and Ann Arbor, Michigan to commemorate the 45th anniversary of China-US Pingpong diplomacy. A concert on the theme of China-US friendship was staged at Jay Pritzker Pavilion of Millennium Park, attracting tens of thousands of audience. 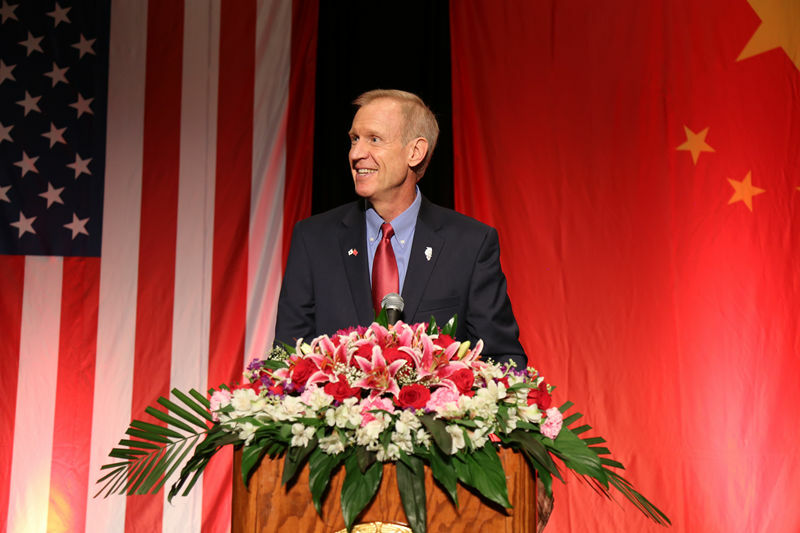 Governor Rauner, attending the national day reception of the Chinese Consulate for the first time, made a speech congratulating the 68th anniversary of the founding of the People’s Republic of China. 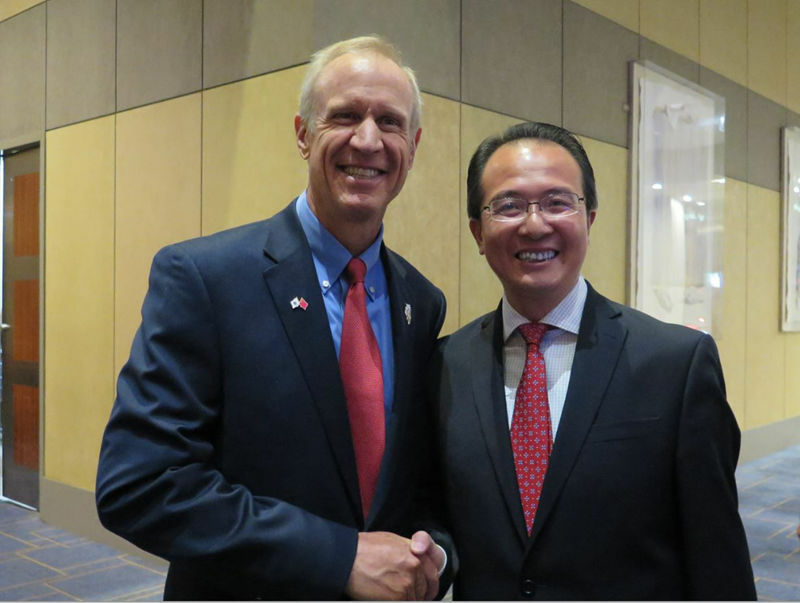 Governor Rauner said that he just made a fruitful visit to China where he met with ministerial and local officials and business leaders in Beijing, Shanghai and Hangzhou. Currently, over 400 Illinois firms invest in China and more than 60 Chinese firms invest in Illinois. There is also a great number of Chinese students studying in Illinois. Illinois should continue to expand cooperation with China in trade and investment, promote common prosperity, provide opportunities for the people of both nations and build win-win partnership. The two sides should further strengthen education and cultural exchanges and encourage more Illinois students to study in China and vise versa. 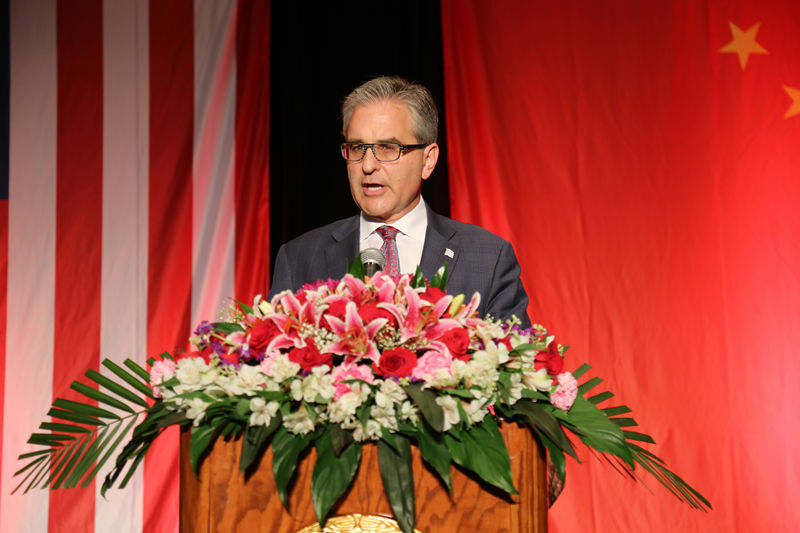 Robert Rivkin, who recently assumed the role of Deputy Mayor of Chicago, sent congratulations to the People’s Republic of China for its founding anniversary on behalf of Mayor Emanuel and the city of Chicago. He said that Chicago has a particularly close relationship with China. Since 1985, Chicago has been sister cities with Shanghai and Shenyang. Chicago has increasingly close relations with China in the areas of trade, investment, education, culture, and tourism. Chinese firms such as Wanxiang, Wanda and CRRC all have major investment projects in Chicago. Chicago and China’s Ministry of Commerce, as well as eight Chinese city reached a gateway cities agreements, which has became a shining example of Sino-US economic partnership. Chicago will continue to be the most China-friendly city in the United States with joints efforts of all. Former US Senator from Illinois Adlai E. Stevenson, State Senator Sue Rezin, Chairman Wang Xingwu of Chinese American Association of Greater Chicago, Chancellor Michael Amiridis of University of Illinois at Chicago, Urbana Mayor Diane W. Marlin, “Flying Tigers”pilot Joseph Cooper’s daughter Gail Baumgartner-Brown, as well as representative of Chinese Student Duan Sinong also addressed the reception, praising China’s economic and social development in the past 68 years and the achievements made in exchanges and cooperation between China and the US Midwest. They all express their willingness to join hands with the Chinese Consulate General to further China’s friendly cooperation with the Midwest and sustain the sound and sustainable development of Sino-US relationship. At the reception, Chinese American singer Tong Tao and Liao Dan sang Chinese and American national anthems. Chinese student Zhang Yiji from the University of Illinois at Chicago performed the song “I Love You, China”. Dong Fang Chinese Performing Arts Association artists performed a quartet of “China, I Sing for You”. A video on the gala performance at BRICS Xiamen Summit was played at the reception. 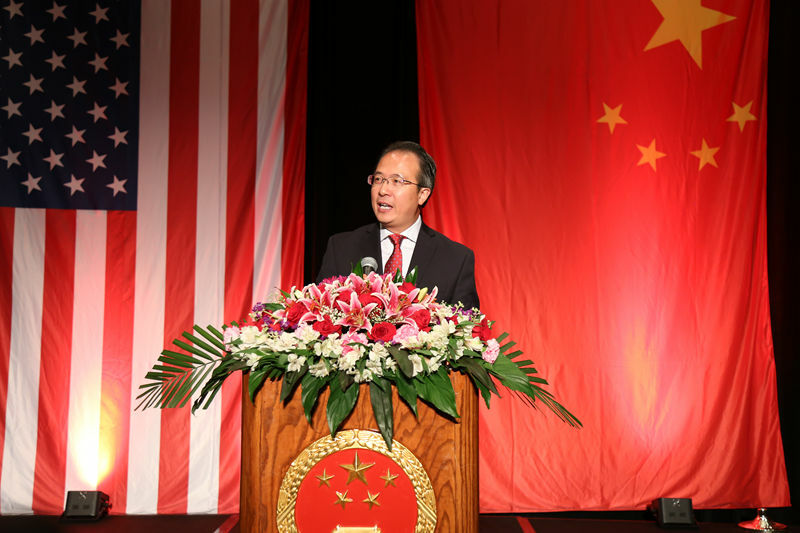 Pictures showing the development of Chinese economy, Sino-US relations as well as China’s major diplomatic events staged at the reception hall attracted a large audience. The reception was held with a jubilant ambience.